Parkland, FL — Broward County Sheriff Scott Israel, during a press conference on Thursday, announced that he has suspended the deputy who was responsible for “protecting” Marjory Stoneman Douglas High School after surveillance video showed that he cowered outside of the building instead of using his weapon to engage the shooter. The deputy in question, Scot Peterson chose to resign Thursday as a result of being exposed. 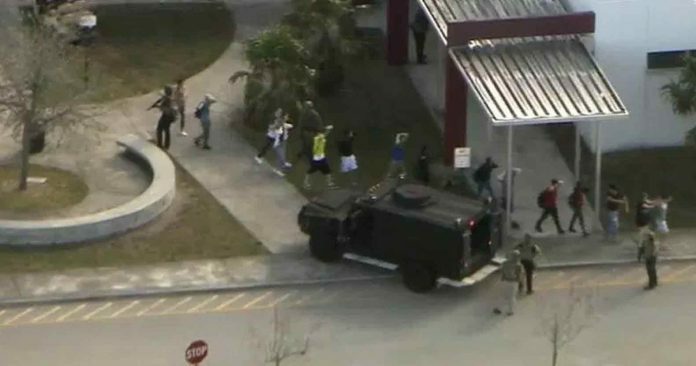 According to Broward, who described what happened, Peterson remained outside of the building while Cruz was inside slaughtering defenseless students. A review of surveillance video showed that the deputy was in position and armed but never entered the building. He remained stationed outside the building while the shooting went on. He said the video was part of the investigation and Israel said it may never be released. Exactly what these deputies did in regards to the shooting remains a mystery. However, as TFTP has reported, police were warned at least 20 times about Cruz making death threats to other students and they did nothing. Everything that was supposed to prevent this tragedy from happening was in place and unfolded as it was designed to do. Nikolas Cruz was reported to the FBI by citizens for publicly declaring that he wanted to become a “Professional School Shooter.” However, the FBI apparently chose not to act on that information. All the police state measures of see something say something happened ‘correctly’, armed police on school campuses happened ‘correctly’, and even the shooter himself publicly claimed that he was going to carry out this atrocity months before doing it—yet it still happened. As TFTP previously reported, seven months ago, Cruz wrote, “I am going to kill law enforcement one day they go after the good people,” in the comments section of a video clip from the NatGeo show “Alaska State Troopers: Armed and Dangerous” that was posted on YouTube. Cruz also posted photos of dead animals and bragged about killing them on his Instagram. By all measures, this kid threw up every single red flag and set off every single warning there is—people reported this to law enforcement—and nothing. No arrests. No questions. And, all of this was in spite of the Florida law called the Baker Act which allows for involuntary examination which can be initiated by judges, law enforcement officials, physicians, or mental health professionals. Police in Florida already had more than enough power and help from citizens to stop this tragedy, but they didn’t use it. How on earth would giving them more power, like Israel is demanding, solve this problem? So, what’s the answer? Should we just hand over more power to the police who demand it? Should we put more cops in schools? Should we ban guns? The answer to the problem of mass shootings lies not in the reactionary nature of the above questions. As we’ve seen over the years, building a police state through a problem, reaction, solution methodology does little to prevent future tragedies as they go after the symptoms instead of the cause. In America, instead of attempting to understand the psychological triggers of mass shooters—and the potential pharmaceutical chemical imbalance that caused them to snap—tragedies are exploited for political gain, used to passed legislation, and pushed to stoke political divide. As this case helps to illustrate, schools do not become safer with more police presence. However, after the tragic shooting legislators began hinting that they would up the police presence in schools. Aside from conditioning children to grow up in a police state, this move is terrible for other reasons as well. Research shows that police officers in schools create an environment that funnels children into the criminal justice system at a young age. Normal adolescent behavior is criminalized and leads to arrests instead of detention. As the case above illustrates, this cop never even confronted the shooter, making his entire presence on campus little more than symbolic. Schools in America are starting to more closely resemble prisons than learning facilities— and more cops facilitate this. Video after video shows the horrific nature of such a practice as children are seen being maced, beaten, and tasered for normal childhood behaviors. The mere act of being a child is now criminalized. Instead of attempting to solve a problem with logic and reason, schools are now taking the easy road and turning to the barrel of a gun to force compliance. The reality is that no amount of police state will ever prevent future tragedies and until we focus on the cause—instead of the symptoms—the problem will only persist.